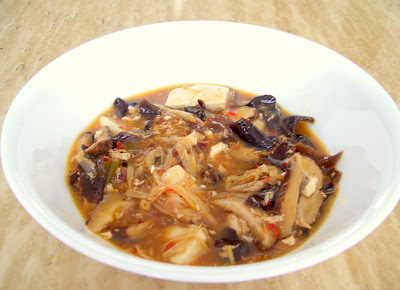 I found a good recipes for Chinese hot and Sour Soup from this site, Closet Cooking. 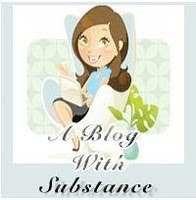 I really like this Blog, his recipes always has a good result, never disappoint me. Soak the tree ear and black mushrooms in boiling water until softened, about 20 minutes, and shred them. Soak the lily buds in warm water until softened, about 20 minutes, and shred them. Cover the bamboo shoots in water, bring to a boil, drain and shred. Mix the vinegars, soy sauce, salt and sugar in a bowl. Mix the cornstarch into the water in a bowl. Add the pork, tree ear and black mushrooms, lily buds and bamboo shoots and saute for a minute. Add the broth and tofu and bring to a boil. Add the vinegar mixture and the cornstarch mixture and stir until it thickens. Pour the eggs into the soup in a thin stream while stirring the soup. Stir in the peppers, oils and chili sauce.